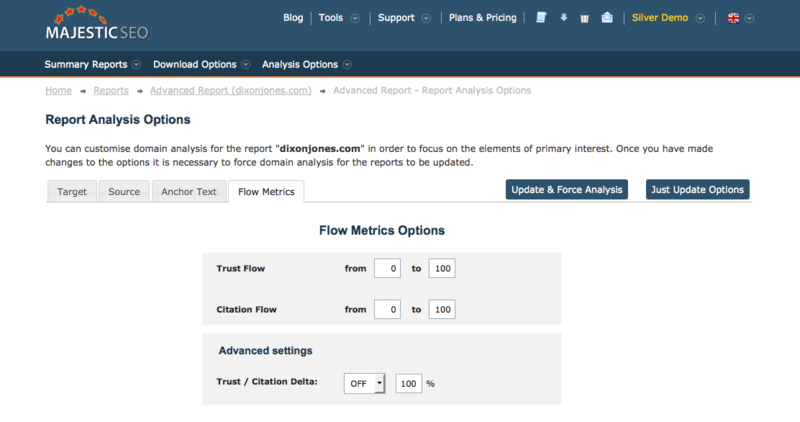 One of the big game changers for Majestic is when we released our Flow Metrics of Trust and Citation Flow. Both these metrics are unique to us and by using them correctly, you will find that these 2 scores can help you so much when you are analyzing your links. Flow Metrics is our algorithm that we use to score URLs and Domains in our data. They are both scores between 0-100, based on a logarithmic scale and they are based on a flow of characteristics throughout the entire web. 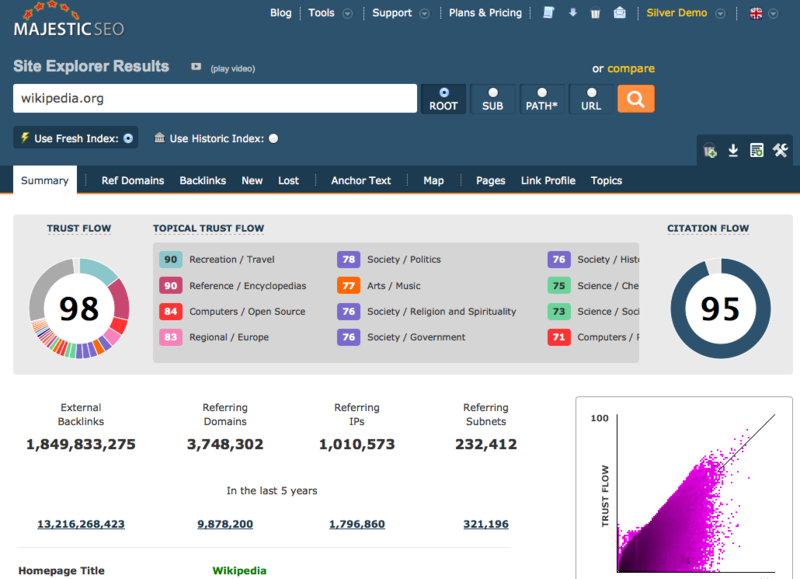 Trust flow is the score based on the trustworthiness of the site. See it as a sort of quality metric for you to measure links and domains by. Citation flow on the other hand, measures link equity or link juice that has been flowed through the web. Watch our Flow Metrics video to learn more behind how the Flow Metrics are decided. Higher the score, higher the better. Yes, however due to the scale of our crawler, only the massively popular websites such as Twitter, BBC and Wikipedia, receives the top end of the scale. Average sized domains tend to obtain scores around 20 for both metrics. Don’t just focus on the numeric scale. What’s really interesting about the Flow Metrics is when you look at the difference between them. Ideally, you would want your website to have both scores equal as possible. Bonus points if your Trust flow exceeds the Citation flow. What you need to keep your eyes out for are websites with high Citation flow but a very low Trust flow. Low quality sites, harmful sites and suspect sites usually get these types of scores. As a general rule, when the Trust flow begins to fall below half to the Citation flow, maybe it is time to re-evaluate that particular site. Not all sites that receive these scores will always be negative. Some blogs and new sites also sometimes would see these differences. At times it could be down to the industry the site is based on. For example the gambling industry mostly receives low Trusted sites purely down to the nature of the sites that would link to them. If in doubt, analyse a competitor or two and see how your scores compare. Easy ways to catch the low quality links. There are a few different methods you could try. The first would be to use the Raw Export feature within the Site Explorer and download all the backlink information and export it into a file of your choosing, Excel, TSV or CSV files are available. Using a program offline, you can then sort columns and organize your data how you need it. Another is within Site Explorer yet again, however this time we are looking at the Ref Domains tab. Within this tab, you will be shown the unique websites that are linking into the target site you are analyzing. 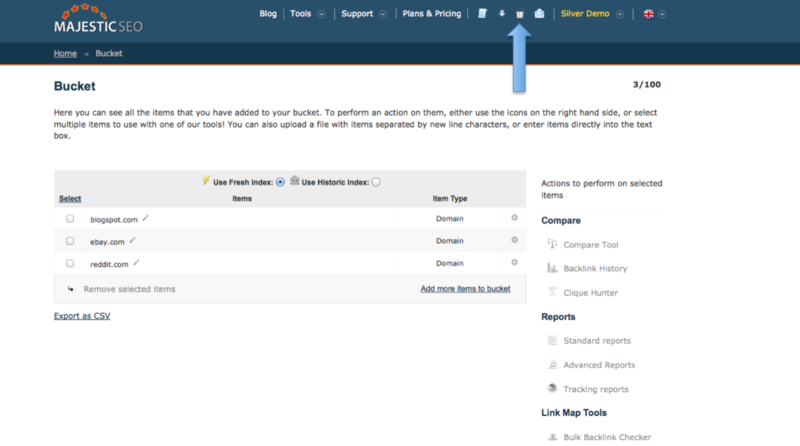 With the helpful drop down menus at the top, you can customize the order of the domain depending on the task at hand. If you are looking at competitors, Trust and Citation flow both in a Descending order can help you figure out who they have been targeting in terms of their link building efforts. Trust and Citation flow in an Ascending order will bring up the 0 scoring domains. These could be very new, small sites but could be used to help clean up your site’s backlink profile. 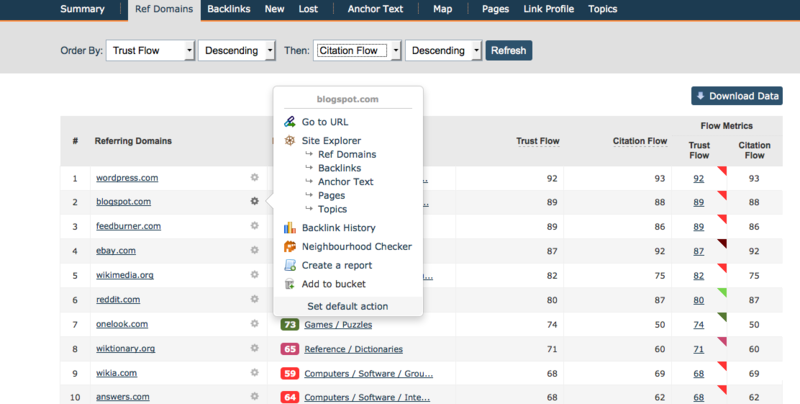 Another way to weed out the more untrusted links would be to have Trust Ascending and Citation flow Descending. You will now see those websites that carry some weight around the web and that have fallen into that suspicious scoring. Simply reading the name of some domains can be enough to determine whether or not that site is going to be useful however, it is always best to check with your own eyes if you are not 100%. Hovering over the small gear icon next to the domain name and you are given the option to visit the source site’s homepage straight from the tool. If you decide it is a spam site, add it into your bucket by going back to the icon. Helping you collect all high priority sites for further research or help create a Google disavow list. You don’t have to limit your bucket to low quality links, add the most eye-catching domain from your competitors profile for outreach later down the line. The final option is within Advanced Reports. Once you have created the report, use the Analysis Options found at the top of the page to filter the links to your specifications. This previous Power User tips post that explains about the different options right at your fingertips. 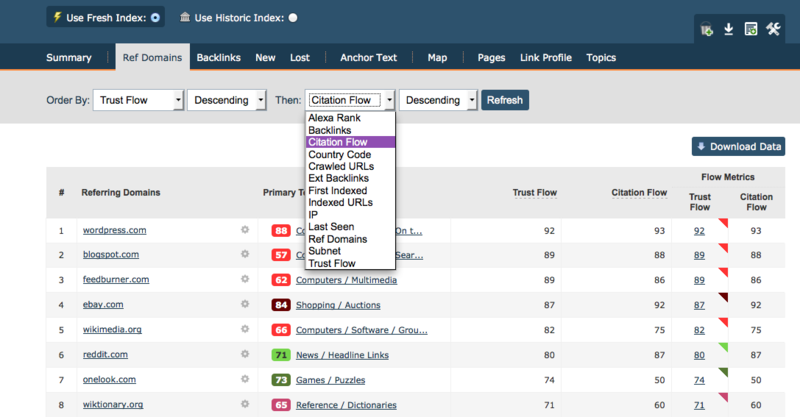 The Flow Metrics tab allows you to look at a specific quality of link. 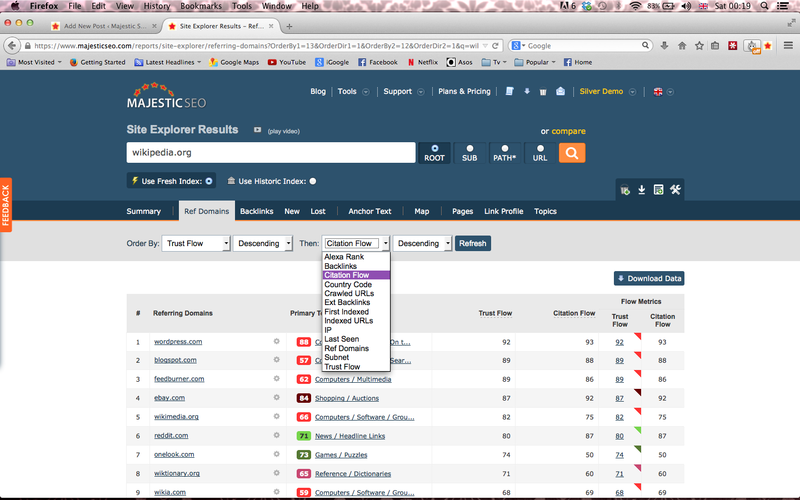 Once you understand the range of scores a websites’ backlinks has, you can chose best what scores you want to focus on. Just type them straight in and hit Update & Force Analysis.